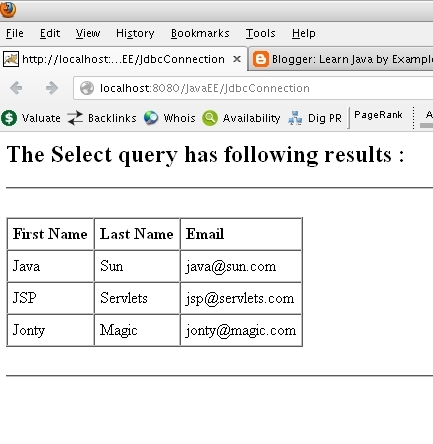 How to perform select sql query in JSP and Servlets using JDBC ? 1. Download the driver jar from Internet and place it in WEB-INF/lib folder of your Web application. Here I am using MySql as Database so I have downloaded the jar with name as : "mysql-connector-java-5.1.20-bin.jar"
2. Create a Database (am using MySql as backend) name as "javaee".